The exhibition Come to Finland – Paradise Calling consists of original and authentic travel posters spanning from the 1890s to the 1960s, plus a number of contemporary travel posters created by Finnish artists for Come to Finland. 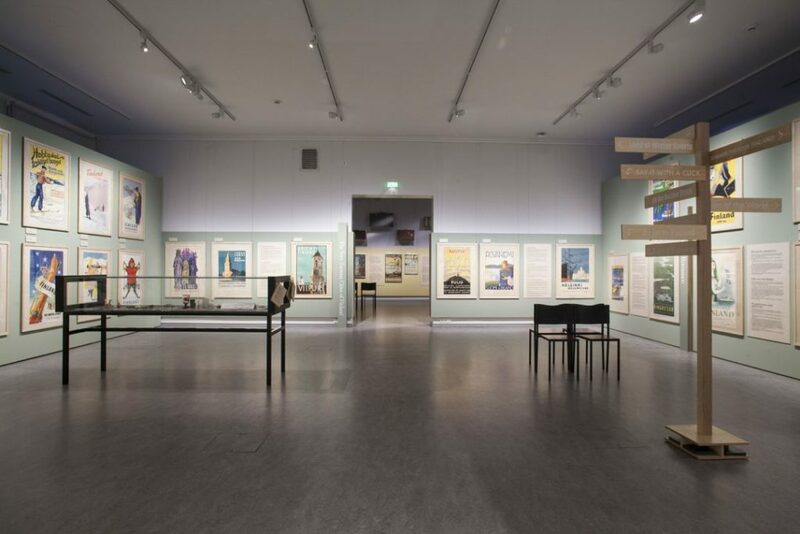 The exhibitions depicts Finnish history through travel posters and insightful information boards (with text) that can be adjusted according to the venue. Number of posters: The exhibition consists of approx 100 framed posters (adaptable). Information boards, number: minimum of 16, maximum 30. These are printed on 6 mm thick plywood. Information boards, size: 630 x 1270 mm. Framing material: Most of the posters are owned and framed by Come to Finland with HDF-board, plywood and plexiglass. Some are framed with metal and glass, and some with wood and glass (these are posters that we’ve lent from other collections). Information boards, material: 6 mm plywood. Exhibition languages: Finnish, Swedish, English. Russian, Japanese and Chinese as handouts. Adaptable for German-speaking markets. Other languages as agreed. Total wall space required: Roughly 70 meters. Props: Come to Finland is willing to co-operate with museums concerning exhibit items from museums. Additional information: A documentary with clips from classic Finnish travel films from the archives of the National Audiovisual Institute and the Finnish Broadcasting Company is included in the exhibition. insurance cover for the exhibition for the duration it is in the exhibitor’s premises (insurance value: 500-3000 euro / poster). Total insurance value: 140 000 €. marketing, invitations to the opening ceremonies, catering at the opening etc. premises and keeping a shop that sells products by Come to Finland (posters, postcards, books etc.). The museum receives a sales commission. Please contact Producer Magnus Londen, magnus.londen(a)cometofinland.fi for more information. Banner photo: Bus crossing a strait in Vörå, Ostrobothnia, 1950-1965, Svenska litteratursällskapet i Finland, CC license.